We are serving in New Jersey since 1999. Visit our website for some roofing examples and to get discount coupons. 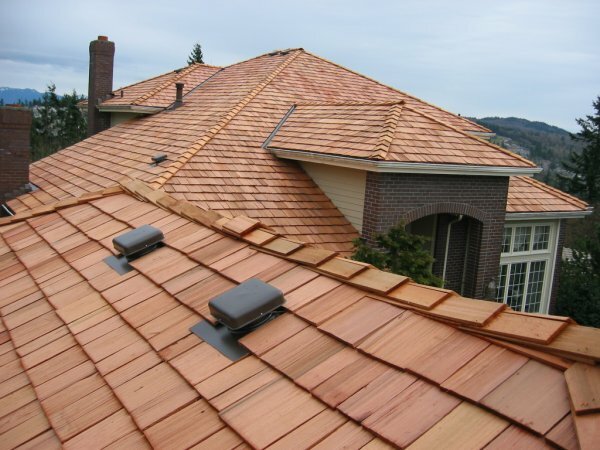 Cedar shake roofing is a traditional type of a roof building material that has been used for hundreds of years. It comes in two varieties, shingles and shakes. A shake is much thicker than a shingle and is split to reveal the uneven natural grain of the wood on the face. A shingle has a uniform appearance and is smooth and tapered on both surfaces. Cedar shake roofing creates such a distinct look that asphalt shingles or metal roof manufactures have entire product lines that try to mimic wood. People choose cedar shake roofs because they are very easy to install, look beautiful and repairing them is very simple. Cedar is naturally bug-resistant and provides great thermal protection. It’s not as efficient at reflecting the sun’s rays as a metal roof but it definitely can save some bucks on heating and cooling costs. For many homeowners, traditional cedar shakes roofing is attractive because it mellows to a silver-gray with exposure to the elements and time. Wood roofs are very resistant to any winds, hail, and storms. They have the highest impact resistance standards required by the insurance industries. However wood roofs need maintenance and the help of chemicals to keep them healthy. They are commonly associated with moss growth. Fungus and mildew can be a problem in humid climates, in such case the wood roofs should be treated with a fungicide after the first year. The most recent alternative to cedar shake roofing is composite shake roofing tiles. For many years traditional cedar shake roofing was the roofing material of choice for many homeowners. Lately people have been rethinking cedar shake roofing shingles because of the cost and fire safety, and have turned to composite shake roofing, which is available in many colors and styles that are easy to install and is less expensive. It is highly resistant to fire and is considered very safe. In fact, many states have required that shake roofs must be replaced with fire retardant treated shake roofs or composite roof tiles that resemble traditional cedar shake roofing materials. Composite shake roofing does not require special tools for each shingle and are less expensive. They also appear very similar to wood shake roofing. Composite shake roofing is made of composite materials that resemble traditional cedar shakes. They are often indistinguishable from their wood counterparts and manufactured with wood grain and colors that are found on natural cedar shake roofing materials. Traditional cedar shake roofing shingles need more attention during the process of installation and very often roofers need to custom shape each shingle to make sure it fits and matches the surrounding shingles. Composite shingles are placed on sheets which make it extremely easy and quick to install. They are readily available and easy for a homeowner to obtain for home roofing replacement project. The only disadvantage is that composite shake shingles don’t have a long product lives. Usually it lasts for approximately 20 to 30 years. However, they are considered very durable roofing material. What are the benefits of metal roof?